Baked Potatoes Fiesta presents the recipe and photos for an all family outdoor event. When writing about "Pappas fiesta" I realized that the subject of potatoes is not just the "small potato" as we use to say about something not important. Connoisseurs know very well that there are many different recipes for making potatoes meals, and some of them can be “quite” sophisticated. As a big potato’s enthusiast I would like to share with you one of my favorite potatoes meals on this free restaurants and food pictures and photos site. The following set of the baked potatoes pictures shows the “step-by-step” process of making “baked potatoes” (very popular in some Slavic countries as a way to make a delicious “All potatoes dinner”. I will call it a “ceremony” because indeed as you will see on the pictures below – it is much more than just “peeling off and baking potatoes”…. Here you see it all! I guess it is so true that a picture is worth more than thousands words. a)	sliced potatoes are mixed with the large amount of sliced onions, carrots, parsley and traditional ingredients like salt, black pepper, bay leaves etc…( Additionally small pieces of sausage can be added although it is not the “must”). b)	The layer of sliced bacon is placed on the bottom and along the walls of the thick metal or clay pot. Even though it is mainly used to prevent potatoes from being burned, certainly the good bacon also adds an extra flavor and smell to the final meal. 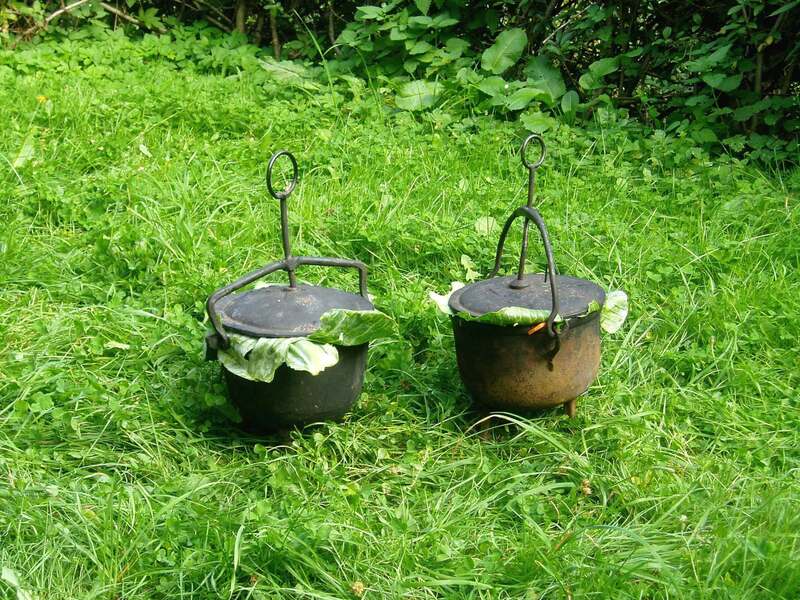 c)	The big leaf of cabbage is used to “seal” the top of the pot. Sometimes instead of the cover, the thick round-cut piece of lawn is placed on the top of the cabbage’s leaf (grass-down). It helps to keep the pressure on potatoes and at the same time allows for evaporation of water, not mentioning its “natural way” aspect. 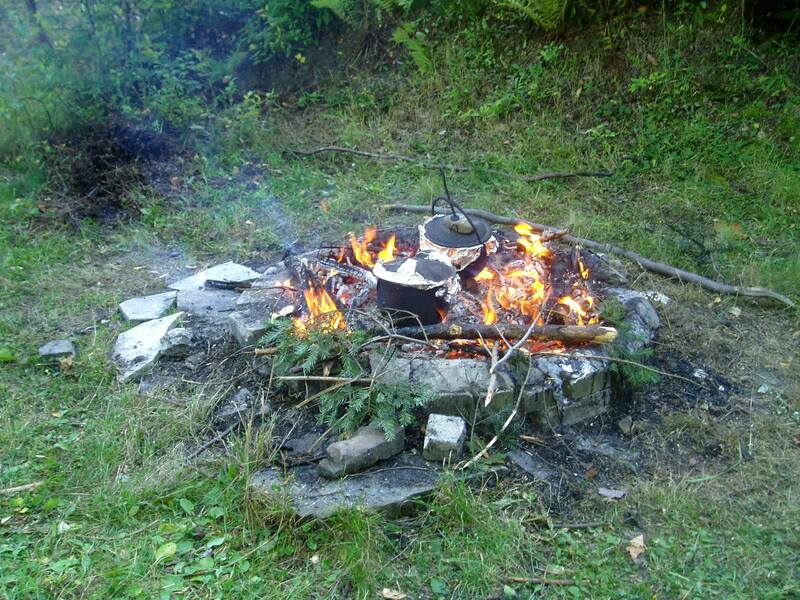 d)	It is time to set the fire around few bricks or flat stones on which later we will put the pots with potatoes. 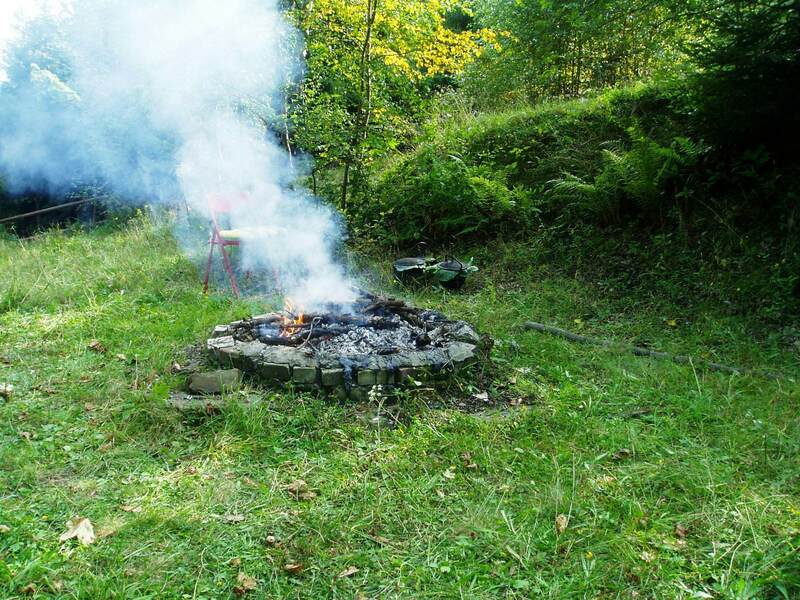 This is also the most “difficult” time for participants because from now we have to patiently wait till the substantial amount of hot ashes builds up (placing the pot in an open fire will burn potatoes). And of course usually at that time our stomachs start to give the sign of life…. e)	Once the amount of hot ashes is sufficient, the pots are placed on the bricks (stones). 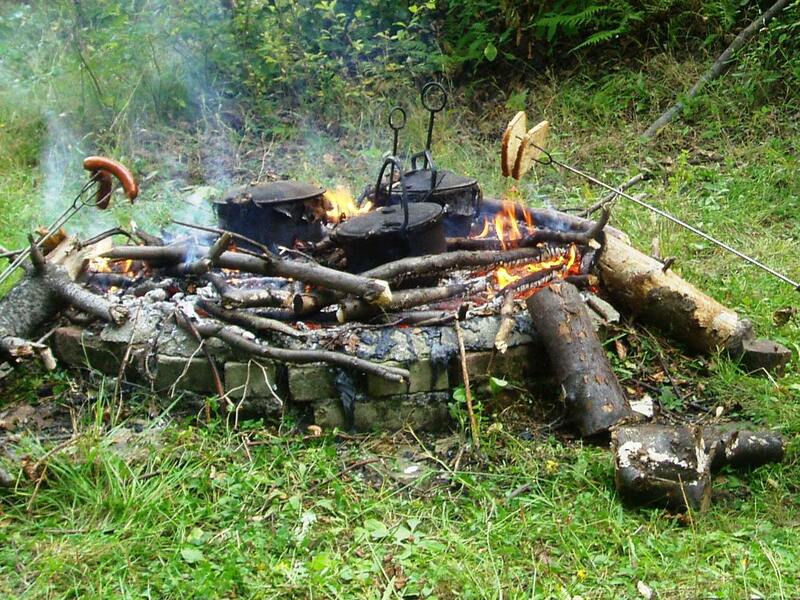 The fire is still kept alive by adding pieces of wood, but this time – in a limited quantity and a bit farther from the pots. f)	The waiting time for the baked potatoes fiesta (about 1 hour) usually is used for roasting sausages and slices of bread on the fire. 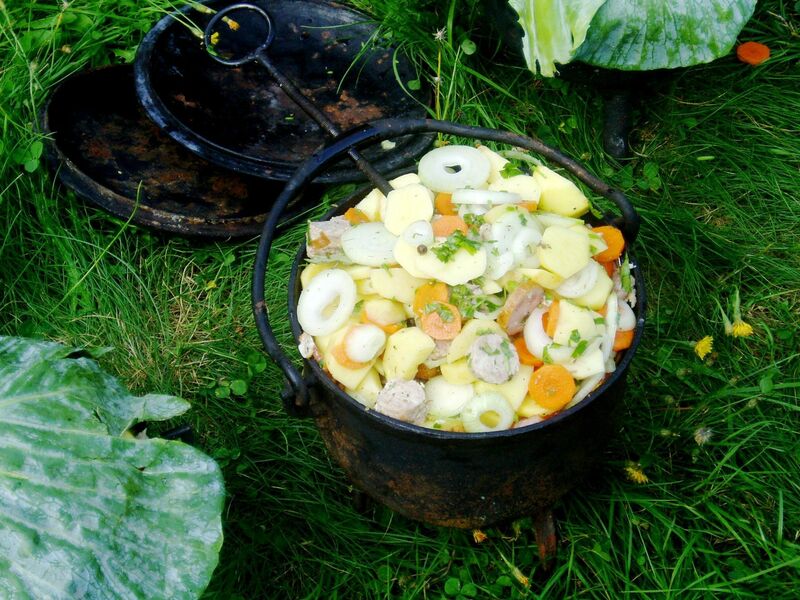 This is the time when believe me, the mouth-watering smell arising from the pots is testing everybody’s patience…. 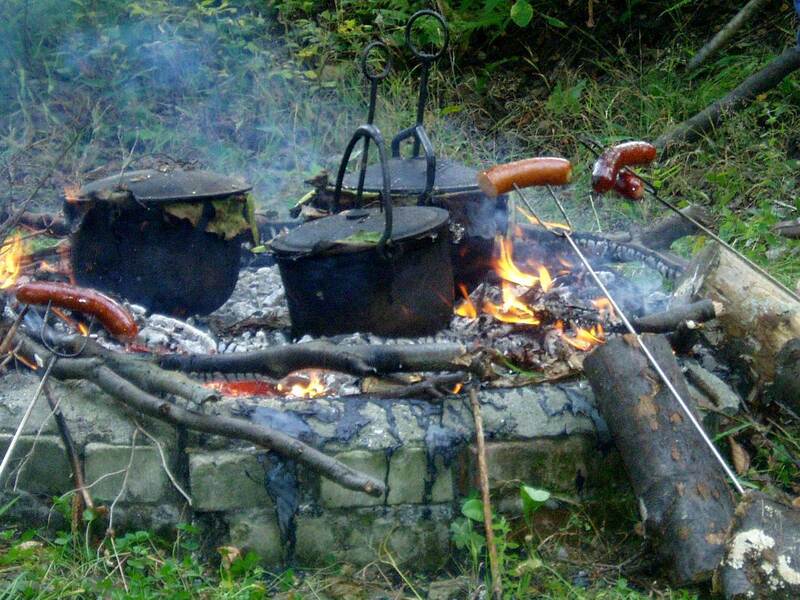 g)	Finally the “Moment” is coming – the pots are removed from the fire with the help of previously prepared long pieces of wood (branches) and their delicious content is thrown to the big bowl (this allows for mixing potatoes with the “melted” bacon from the bottom of the pot. Habitually the only addition to these potatoes is the plain yogurt….. and the saga continues till the “Evening with a Bone-Fire” and singing. What makes it really so special is also the fact that the “Baked Potatoes Fiesta” is traditionally a Family Event in the nature. It allows everybody to take pleasure in the preparation for the fiesta, in savoring the delicious baked potatoes and continuing the enjoyment till the late evening. A guitar may help creating the pleasant atmosphere – I know it from my own experience. I’m living however this part of the fiesta for the discretion of participants. Finally this is a huge opportunity for imagination to reach the sky….:-). I hope you enjoyed the baked potatoes fiesta presented by the Free Food Pictures - Baked Potatoes Fiesta site. Now it is the time to live this experience personally – and I wish you all the best on your way to enhance the culinary expertise and outdoor pleasures.